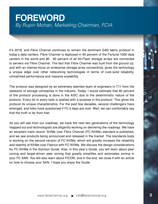 After more than 20 years in the marketplace, Fibre Channel (FC) continues to be the most trusted Storage Area Network (SAN) connectivity of choice in leading Data Centers. The ability to reliably store and retrieve a company’s most valuable asset, its data, is not to be taken lightly, and wise organizations continue to trust this technology because after more than 120 million ports shipments1, Fibre Channel has proven that it is a technology to be trusted. At this point in 2018, more than 43 million ports are estimated to be in current service2 which also reflects on Fibre Channel’s utility as much as its enduring reputation for reliability. This isn’t to say that the technology is stagnant – far from it – in 2018 the Fibre Channel industry has been active in developing technology standards that advance performance and features to ensure that it is the un-restricted conduit between All Flash Array storage performance and applications running on the latest generation of high core-count multi-processor servers. 2018 will be known as the year of Gen 6 Fibre Channel, with all major pieces of the server and storage ecosystem now shipping 32GFC into the marketplace in volume. This year, server vendors released new servers based on Intel’s new Xeon scalable processor technology, nearly all of which are qualified for Gen 6 storage adapters. All Flash array shipments have increased year-over-year by 54.7 percent according to analysts, many of which are now shipping with Gen 6 Fibre Channel interfaces. The combination of the latest generation of servers and All-Flash arrays connected with Gen 6 FC will enable storage bandwidth starved application to accelerate like never before. In fact, the combination of new server and storage technology is proving to be the catalyst that is driving the 32GFC speed transition from previous speed transitions at a rate faster than ever. The technical development for Gen 7 Fibre Channel is also well underway with the standard expected to be published in 2018, so we can expect the first 64GFC speed products to ship during 2019. 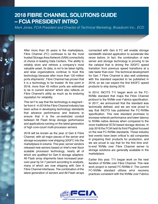 In 2014, INCITS T11 began work on the FC-NVMe standard that maps the Fibre Channel protocol to the NVMe over Fabrics specification. In 2017, we announced that the standard was technically defined, and we are now proud to say that INCITS has published the FC-NVMe specification. This new standard promises to increase network performance and lower latency to NVMe native devices when compared to the more traditional SCSI-based storage devices. In July 2018 the FCIA held its third Plugfest focused on the new FC-NVMe standards. These industry test events have been critical to aid companies in preparing their products for production, and we are proud to say that for the first time end-to-end NVMe over Fibre Channel server to storage solutions are generally available in the marketplace. Earlier this year, T11 began work on the next iteration of NVMe over Fibre Channel. This new work project is named FC-NVMe-2. The current FC-NVMe standard utilizes error recovery practices consistent with the NVMe over Fabrics specification – in the event of an unrecoverable Transport error, the NVMe Transport connection and association between the host and controller should be terminated. A new association and connection must be created before I/O can proceed. FC-NVMe-2 adds Transport error recovery at the Fibre Channel level to avoid connection and association termination. These enhancements bring the same level of reliability to NVMe over Fabrics that traditional Fibre Channel customers have come to expect. The FC-NVMe-2 standard is expected to be completed by the end of 2018. Last year, we launched the FCIA Education Committee in an effort to streamline our outreach to Fibre Channel end users and developers by presenting important topics involving Fibre Channel technology via live webcasts. The topics range from entry level education on current Fibre Channel usage to advanced topics and discussions on new advancements. The live presentations are hosted on the FCIA channel on BrightTALK3. The webcasts are available for replay at your convenience as are presentation downloads and Q&A notes at the https://fibrechannel.org/webcasts/ link. We are very excited to already have over thousands of subscribers to the channel as well as a strong hit rate on the offline materials. After more than 20 years, the Fibre Chanel industry continues to thrive. Driven by the FCIA Fibre Channel roadmap, the industry continues to develop new standards for increased speed and features such as Gen 7 and FC-NVMe. Interoperability and reliability are proven attributes of the Fibre Channel technology that are achieved by over 39 FCIA promoted Plugfests. We look forward to engaging with our end users via education and social media and we look forward to advancing the Fibre Channel industry for years to come. “Dell’Oro estimates that more than 120M Fibre Channel ports have shipped since 2001” – Q417 Dell’Oro Worldwide SAN Report. “Given an estimated five year service life Dell’Oro estimates that more than 43M Fibre Channel ports may still be in service as of the end of 2017” – Q417 Dell’Oro Worldwide SAN Report.